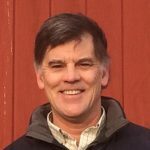 Warren Whitney is the land trust program director at Maine Coast Heritage Trust, and works to bring a variety of communications, training, networking, capacity building and other services to Maine’s land trust community. He began his career in the computer mapping world (what we now call GIS), and was the executive director of a small land trust. He’s a graduate of Dartmouth College, and enjoys cross country skiing, fishing and canoeing on the “west coast” of Maine.